Are you a Parks and Recreation fan? Today, NBC announced new details for their upcoming TV show with Nick Offerman and Amy Poehler, Making It. 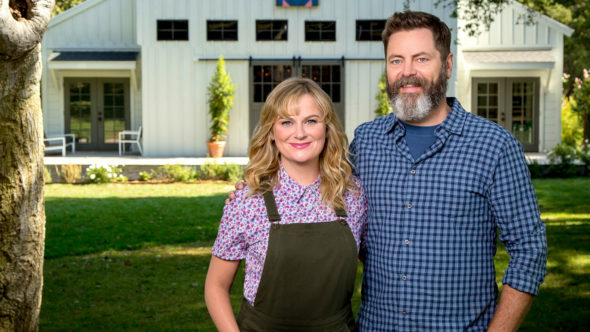 Hosted by Offerman and Poehler, the six-episode series follows eight crafters as they “vie for the title of “Master Maker” and a $100,000 grand prize.” Contestants include interior designer Joanna Gick, blogger Amber Kemp-Gerstel, woodworker Khiem Nguyen, and paper artist Jeffery Rudell. Making It premieres on NBC on July 31st at 10 p.m. ET/PT. UNIVERSAL CITY, Calif. – June 20, 2018 – Eight Makers will vie for the title of “Master Maker” and a $100,000 grand prize on NBC’s “Making It,” which premieres Tuesday, July 31 at 10 p.m. ET/PT. The six-episode crafting series, hosted and executive produced by Amy Poehler and Nick Offerman, will feature judges Dayna Isom Johnson, Etsy’s trend expert, and Simon Doonan, Creative Ambassador for Barneys New York. Every episode of “Making It” will revolve around a central theme that draws inspiration from hugely popular nationwide trends in crafting and DIY, which the whole family can enjoy. Simon Doonan, who is Creative Ambassador for Barneys New York, has worked in fashion for more than 35 years, winning many awards for his groundbreaking window displays, including the CFDA (Council of Fashion Designers of America) Award. Dayna Isom Johnson, Etsy’s trend expert, is in constant pursuit of new and unique finds on Etsy’s global marketplace. She is responsible for keeping her finger on the pulse of the hottest trends in the market and what new products are bubbling up. “Making It” is executive produced by Amy Poehler, Brooke Posch, Nicolle Yaron, Nick Offerman, Dave Becky and Anthony Dominici. The series is produced by Universal Television Alternative Studio in association with Paper Kite Productions and 3 Arts Entertainment. What do you think? Are you into crafts? Will you watch Making It? Hi l love this show Amy and Nick are great hosts. But l have been disappointed in the judges choices. Especially the All holiday challenge, Robert went home. I loved his home display it was simple but so tasteful on the other hand Jo’s looked like a school project. I love all of them but she fell flat. I think the judges were wrong. Love your work Robert. I want to be a contestant. How? I’m a fan!!! !